This title has been removed from sale. NOTE: You are purchasing a standalone product; MyBizLab does not come packaged with this content. If you would like to purchase both the physical text and MyBizLab search for ISBN-10: 0134088506/ISBN-13: 9780133920581. That package includes ISBN-10: 0133920585/ISBN-13: 9780133920581 and ISBN-10: 0133935485 /ISBN-13: 9780133935486. A better way to learn business. Better Business offers the business content students need, but in a better way. By presenting the material in a stimulating Q&A format, Better Business encourages students to come to class prepared to have better conversations and a truly engaging classroom experience. One of the most significant shifts in the business environment since the first edition of Better Business is the explosive growth of social media in all parts of business. 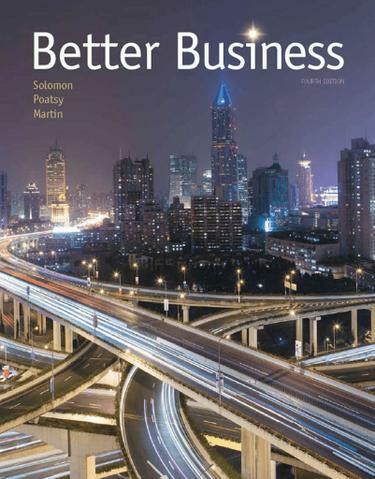 The Fourth Edition of Better Business continues to feature social media strategies and technologies in over 85% of its chapters, as well as significant updates to the technology chapter. Better Business is is integrated with MyBizLab which gets students to interact with business, not just read about it. MyBizLab also assists instructors with their course prep, making it convenient to access and assign modern, interactive resources.